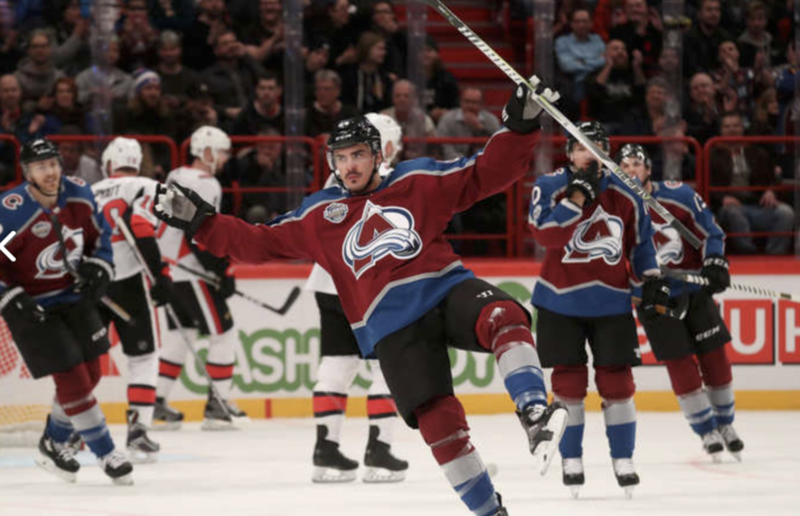 The Colorado Avalanche began the NHL Global Series double-header against the Ottawa Senators with a 4-3 overtime loss in front of a sold-out Ericsson Arena. The Avs had to tie up the game twice to force OT, but lost the extra point after Mark Stone scored the game-winning goal a minute into the extra frame. 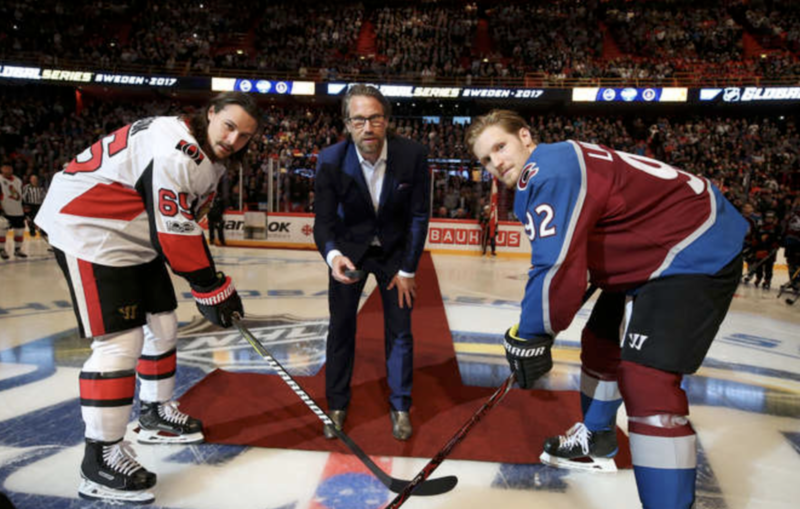 Following the ceremonial puck drop by Avalanche legend Peter Forsberg, the Avs came out flying right out of the gate, going on the power-play only a minute and 15 seconds into the game. Despite generating several solid chances, Colorado came up short on the man-advantage. Five minutes later, Alex Burrows’ high sticking minor gave the Avs’ their second power-play of the night. Colorado was more successful this time, as Alex Kerfoot found Nail Yakupov in the slot, who then beat goalie Craig Anderson with a short-side wrist shot. The Avs held their only lead of the game for 20 seconds, as Stockholm native Fredrik Claesson tied the score with his first goal of the season, beating Semyon Varlamov with a rocket into the right corner. Gabriel Landeskog had a great opportunity to get the Avs back in front, but missed the open net with Anderson sprawled out on the ice. Ottawa seemed to gain momentum with their tying goal and got their first lead of the game seven minutes later, as Mark Stone spun around Samuel Girard and Tyson Barrie, and redirected a tape-to-tape pass from Johnny Oduya into Varlamov’s net. Landeskog had yet another scoring chance, but his shot somehow only found the stick of Anderson and the score didn’t change until the buzzer. The Avalanche got back on track early in the second period and were rewarded when Kerfoot deflected Blake Comeau’s shot from the point. Newcomer Girard earned an assist on the play, his very first point in an Avalanche jersey. The Senators answered less than four minutes later after the puck fell out of Varlamov’s glove and Chris DiDomenico only had to tap it into the open net. The Avalanche went on the penalty kill after J.T. Compher was sent to the penalty box for roughing. Colorado killed off the penalty, but No. 37 was replaced in the sin bin by No. 57 less than forty seconds later, as Gabriel Bourque was given two minutes for tripping. Following a turnover by the Senators, Matt Nieto was slashed on a shorthanded breakaway and the referee pointed to center ice for a penalty shot. Nieto tried to go glove side, but Anderson got a piece of it and the Avalanche remained down – both by a goal and by a man. Nothing much happened during the remaining minute and half of the period and both teams went to the locker room with the score being 3-2 in favor of the Senators. Colorado got outshot 12-3 in the period and also had trouble in the faceoff circle, their winning percentage dropping below 30%. The Avalanche’s offensive woes continued in the final period of regulation - the team went an extended period without sending a shot on Anderson, as the offense had trouble staying in Ottawa’s zone. The Senators were dominating throughout the entire period and only several good defensive plays and misses prevented the Avs from falling behind further. Despite being pressured from the beginning of the period, Colorado managed to tie the score for the second time, when Landeskog got free between the circles, sent a pass to Rantanen, who then found MacKinnon for a tic-tac-toe goal that wouldn’t earn a lot of style points. MacKinnon hit the puck with the heel of his stick blade and it barely slid by Anderson’s right pad. The Avs managed to hang on until the end of regulation, but fell with a minute gone in overtime after Derrick Brassard found a wide-open Stone for his second goal of the game. The Avalanche were outshot 32-19, only combining for 8 shots during the last two periods. “We passed up on some shots. I was surprised that it was only eight [shots on goal] to be honest with you,” said head coach Jared Bednar during his post-game conference. Despite wanting to cut down his ice-time, Erik Johnson had a TOI of 30:02. Tyson Barrie had the second-highest TOI on the team with 22:46. Samuel Girard logged a TOI of 21:55 in his debut with the Avalanche, the third-highest ice-time on the team. Girard initially started the game paired with Tyson Barrie, but played the second period alongside Erik Johnson. He was back with Barrie for the final period of regulation. Alex Kerfoot extended his point-streak to three games, recording three goals and two assists during that span. Nathan MacKinnon extended his to five games, scoring four goals and 10 points over the course of those games. Ottawa coach Guy Boucher remains undefeated by the Avalanche in regulation as a head coach (4-0-1).